Tuesday | June 28, 2016	This July, Bakerzin brings you a captivating surprise – the Rosemary Chocolate Cake*. This trendy creation draws the attention to the layering design, flavours and the innate texture of the cake. Made by laboriously beating the batter with exquisite extra dark cocoa powder, the light and porous layers of sacher sponge cake carries rich wholesome taste. Mixed in the batter are premium Hazelnut grounds to give a crunchy texture to the soft sponge cake. A touch of Kirsch syrup is lightly brushed onto the cake. Generously sprinkled with cranberries soaked in Kirsch, the luxurious spread of rosemary ganache provides an earthy note to complement the rich flavors of the chocolate sponge cake. 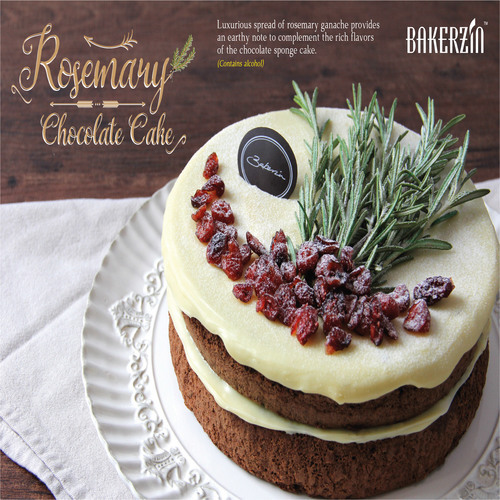 Rosemary Chocolate Cake is available at Bakerzin outlets and Bakerzin Eshop from 1 July 2016 onwards.